Pietrasanta, tucked between the Apuan Alps and the coastal resorts of the Versilia Riviera, has been nicknamed the “little Athens” of Italy. Its tie to elite artists goes as far back as to when Michelangelo spent three years in the town, quarrying on the top of Monte Altissimo. Pietrasanta in Concerto, running from July 20-29, one of the most prestigious classical music festivals in Europe, welcomes many of the genre’s biggest names. 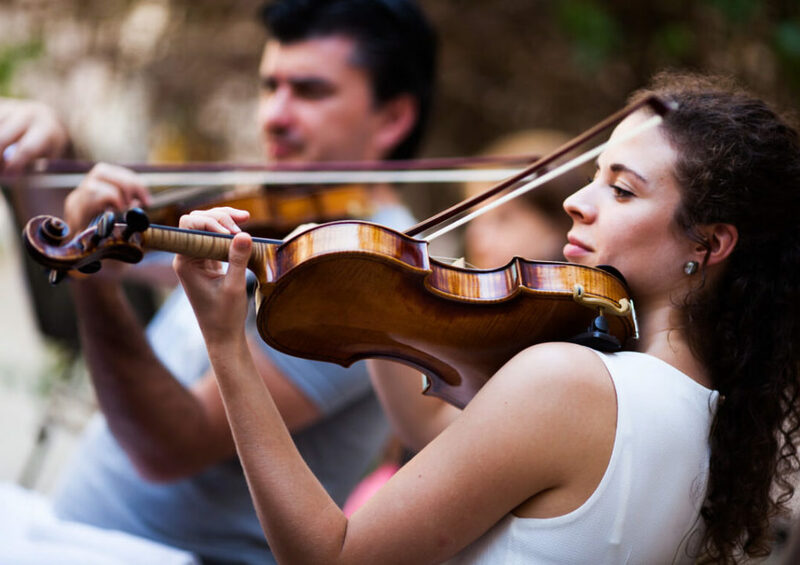 The 12th edition boasts nine nights of scintillating performances in the town’s Cloister of Sant’Agostino, featuring world-famous violinists Nigel Kennedy and Vadim Repin, among many other classical superstars. Past performers and ambassadors of the festival have included the great pianist Martha Argerich and Italian violinist Salvatore Accardo. Siberian-born violin legend Vadim Repin will inaugurate Pietrasanta’s jam-packed week with a performance on Friday, July 20 in collaboration with the Trans-Siberian Art Festival, with by Vassilis Varvaresos on piano playing his own “Star Wars Variation.” At age 11, Repin won a gold medal in all categories at the prestigious Wienawski Competition. Debuting internationally at age 14, and performing in Carnegie Hall a year later, he has gone on to front the world’s greatest orchestras for sold-out crowds. Accompanying Repin is a string group featuring Michael Guttman (artistic director of Pietrasanta in Concerto), and other artists. They will interpret the romantic works of Mahler and Tchaikovsky. Saturday, July 21 premieres a concerto for piano, violin, cello, and orchestra by Georgian composer Guia Kantceli. Russian pianist Lera Auerbach will star, joined by violinists (and off-stage couple) Pavel Vernikov and Svetlana Makarova, and accomplished Chinese cellist Jing Zhao. Auerbach will also perform Mozart’s haunting Concerto in D minor (K.466) with the Georgian Chamber Orchestra of Ingolstadt (GCOI). Vernikov and Makarova return to the stage the following night, Sunday, July 22, this time with the accompaniment of GCOI and Michael Guttman, Anton Martynov and Kremena Nikolova on violin. The concert will center the famous theme of La follia, originally composed by Geminiani, later adapted by various composers. The tangos of Piazzolla will be paired with the baroque-dance inspired compositions, injecting an Argentine dose of passion into a night of Italian and Russian fusion. On Monday, July 23, a free concert featuring a fusion-based ensemble, “Janoska,” will be held in the Casa Diocesana La Rocca. The group mixes classical conventions with the virtuosity of gypsy-dance music and the free-flowing improvisation of jazz. Tuesday, July 24 a mid-summer celebration of Mendelssohn features violinist Marc Bouchkov — returning on the heels of a resounding success at last year’s festival, and first-timer at Pietrasanta: pianist Katia Skanavi, playing alongside the Brussels Chamber Orchestra. In a first-time excursion into operatic terrain for the festival, the program turns to Verdi, Puccini, and Donizetti on Wednesday, July 25. Soprano Cinzia Forte, the Operatic Choir of Parma, and the Musicians of Parma (led by Enrico Fagone), will bring the famous arias of these Italian greats to Pietrasanta. Paganini Prize finalist (winner of the audience prize), Fedor Rudin, is featured in the program of Thursday, July 26, accompanied by pianist Dario Bonuccelli. The lineup is an energetic tribute to history’s most famous violin virtuoso and composer, Paganini, as well as the more contemporary works of the Azerbaijani Gara Garayev in honor of his 100th birthday. Kennedy will perform on Friday, July 27 in a concert titled “Bach Meets Kennedy Meets Gershwin.” The program showcases the impulsive, irreverent violinist’s diversity of talent. Kennedy’s characteristic refusal to conform to rigid boundaries and definitions of classical music has brought him popularity. His musical defiance carries a certain electricity as well, easily sensed just from the unique pairing of composers in his Pietrasanta recital. His “cover” of Vivaldi’s Four Seasons is one of the best-selling classical records of all time. Kennedy will start with Bach’s baroque ingenuity and end on the stylish, 20th century compositions of Gershwin. Here, he refuses to shy away from the friction of disparate genres and periods and ensures audiences are hearing something unapologetically unique and stimulating. In tandem with the musical events of Pietrasanta In Concerto, the town’s more well-known artistic media are honored in The Shape of Music: an exhibition focusing on the intersection and fusion between art and music. “We are very happy to present a beautiful display of art with marble work, bronze, and paper—inspired by the perfect and mysterious form of my instrument: the violin” comments Michael Guttman.